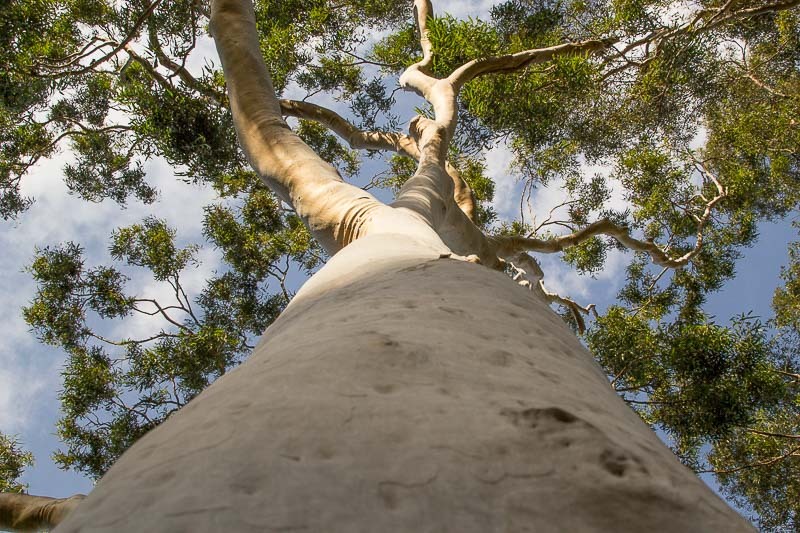 A native of eastern Australia, the Lemon Eucalyptus tree yields valuable essential oil, wood and nectar for honey production. There are two subspecies recognised, Corymbia citriodora subsp. 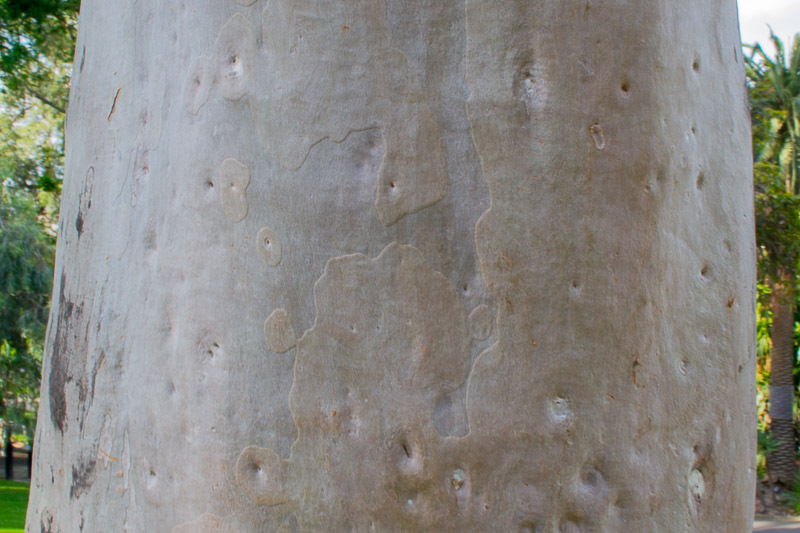 variegata, with a natural range limited to the subtropics and Corymbia citriodora subsp. citriodora, with a more expansive range that extends from the subtropics to the hilly tropics. 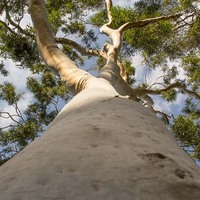 It is fast-growing and may become a large tree, reaching heights of up to 50 m (165 ft) in natural woodland and forest habitats, though is more commonly 20 to 30 m (65 to 100 ft) tall. 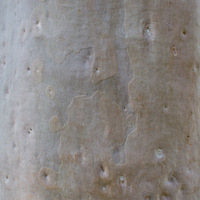 The trunk is usually straight, slender, mostly branch-free and with flaking bark that exposes smooth creamy-white, pink or bronzed coloured bark underneath, depending on the amount of weathering that has occurred. The branches are few and ascending, forming an open, moderately leafy rounded crown. The leaves are typical of oil-yielding Eucalyptus, being dull green with a narrow blade shape and those of subsp. citriodora have a strong lemon fragrance when crushed. From winter to spring, small powder-puff-like flowers with long white stamens come into bloom and are succeeded by woody, urn- or egg-shaped seed capsules enclosing small seed. The leaves of subsp. citriodora yield commercial quantities of a lemon-scented essential oil extracted by steam distillation. The oil is used mainly as a fragrance component in perfume and toiletry products and as raw material for the production of menthol. A high citronellal content also gives it natural insect repellent properties. About 10,000 to 25,000 kilograms of fresh leaves are harvested per hectare per year in commercial plantations and with an average oil content of 1% yields 100 to 250 kilograms of oil, the equivalent of 90 to 220 pounds of oil per acre. Both subspecies produce a heavy wood in the 800 to 1000 kg per cubic meter (50 to 62 lb per cubic ft) range, with high natural resistance to decay and wood-boring insects. This classes it as a durable hardwood suitable for indoor and outdoor construction. The sapwood is whitish and the heartwood light to dark red-brown with attractive, wavy figuring. Well-formed logs are sawn into beams and planks used for heavy and light construction, railway sleepers, house framing, as well as internal and external flooring or decking. Smaller diameter roundwood is cut for transmission poles, fence posts, high impact tool handles and for fuelwood, either for firewood or for making charcoal, which burns steadily and produces little ash. The flowers serve as a valuable source of pollen for brood-rearing honeybees and as a source of nectar for honey production, in its native Australia, as well as in countries where the tree is an introduced species. It is reported as a major, introduced honey plant in Brazil, Madagascar and Mauritius, with honey yields per hectare of trees estimated at around 113 kgs (249 lbs) per year. The honey is light to medium amber in colour, firm-textured with a fair flavour and is slow to granulate to a coarse brown grain. It is sometimes cultivated in large gardens as a landscape tree on account of its slender, erect form and smooth cream-coloured bark. Grows naturally in moderately humid subtropical and tropical mid-elevation climates, generally best in areas with annual lows of 10 to 19 °C, annual highs of 19 to 32 °C, annual rainfall of 600 to 2300 mm and a dry season of 7 months or less, extending to 12 months with irrigation. New plants are usually started from seed, which are tiny and don't require a covering of soil to germinate but benefit from soaking in water overnight. Performs best on free-draining loam and sand soils of a moderately acid to slightly alkaline nature, generally with a pH of 5 to 7.5 and on sites with full sun exposure. Large amounts of small seed are produced and fall to the ground where they germinate readily. It is assessed as a high weed risk species for Hawaii and Florida, respectively by the Hawaii Pacific Weed Risk Assessment project (HPWRA) and the IFAS Assessment of Non-Native Plants in Florida's Natural Areas. Little, E. L. & Skolmen, R. G. 1989, Common forest trees of Hawaii (native and introduced), Agricultuural Handbook No. 679, Forest Service, U.S. Department of Agriculture, Washington, D.C.
Little, E. L. 1974, Trees of Puerto Rico and the Virgin Islands, Vol. 2, United States Department of Agriculture (USDA), Washington D.C.